Porcini mushrooms, with their earthy, meaty flavour, make the perfect pairing with tender chicken in this easy and filling midweek meal. 1. Soak the porcini mushrooms in hot water for 10 minutes, then drain. Meanwhile, heat 1 tbsp of the oil in a large, wide saucepan over a medium heat, then add the chicken and fry for about 4-5 minutes until cooked through with no pink meat. Remove from the pan and set aside. Add the remaining oil to the pan, then add the shallots and fry for 1-2 minutes until softened and just beginning to colour. 2. Stir the stock pots into 1 litre of boiling water. Add the garlic, thyme and risotto rice to the pan and stir well for a further minute, until the oil has coated the grains of rice. Pour in the wine and allow to bubble, then add a ladleful of the stock. Reduce the heat and simmer for 10 minutes, continuing to add ladlefuls of stock. Stir and allow each one to be absorbed before adding another. 3. Add the porcini mushrooms and cooked chicken to the pan, and simmer for a further 6-8 minutes, stirring and continuing to add extra stock as necessary. 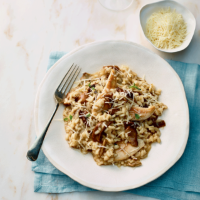 When the risotto is creamy and the rice is tender with a slight bite, take the pan off the heat and stir in the butter and cheese. Serve topped with a little extra cheese and a good grinding of black pepper. Cook’s tipTo really push the boat out, top each portion with a little drizzle of truffle oil and a handful of wild rocket.